Over the past few years, Google’s algorithm updates have become gradual with no announcements. Until and unless you keep a close watch over its every movement, you’ll have no way of knowing for sure about any of the important updates. 2017 was yet another year when Google brought forth a number of changes relevant to its search features and functionalities for the near future. With the rise of mobile being the device of choice for many users to conduct a search, it favored IOT and voice-based search. This was an extension of its mobile-first indexing, which it introduced sometime back. Moreover, it came as no surprise when Google gave precedence to short, bite-sized content to accompany the search queries. It also took the user experience up many notches by tackling the persisting issue of the interstitials. Web pages that compromised on providing superior user experience were adversely affected by Google’s quality updates. For instance, websites that focused heavily on revenue generation and neglected users were dead in the water. However, the most prominent change that we came across was the shift from “what people are searching” to “how they are conducting the searches.” In addition to this, by taking into consideration user-generated content, Google’s Ranking Factors depended on the work of content creators who came up with high-quality content and added to the search engine’s rich repository of information. 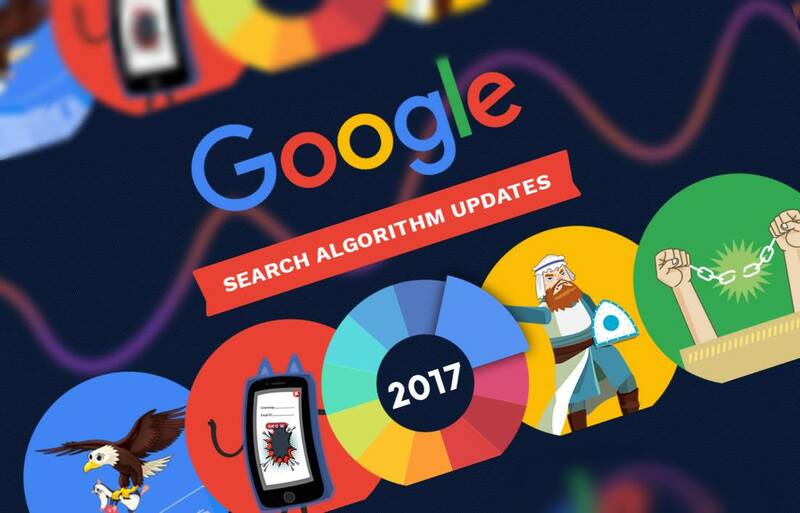 That said, here are 11 of the biggest Google Search Algorithm updates of 2017 that caught our attention. Take a look at the infographic from E2M Solutions to get a better perspective. Intrusive Interstitials: Mobile sites that shows interstitials covering the content when users clicked through from web searches were penalized. Hawk: This was a local update that killed off some of the changes that were brought into effect by possum in 2016. Google removed a filter that prevents local businesses that shared an address or building from appearing in the same pack. Increase in Meta Description length: After SEO folks noticed significantly longer snippets in the Search engine result pages, Google confirmed pulling more data from page content to show more description results. The average length of meta descriptions has grown from 160 to 230 characters.